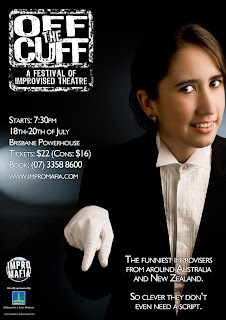 Tickets are now on sale for Off the Cuff: A Festival of Improvisation. Playing at the Brisbane Powerhouse from 18 to 20 July, it will feature the best players from Sydney, Melbourne and New Zealand, as well as your local favourites. If you like improvised theatre, comedy, drama - you will love this. There's a smorgabord of shows on offer - check out the website for more details on the schedule. Best of all, it's only $22 adults and $16 concession per night. You can book now through the Powerhouse's website. Book five or more people - and you all get in for the concession price! Ring the Powerhouse on 3358 8600 for more information.